There is a long tradition of philanthropy in the automotive world. Many of the world's largest charities are related to the founders of automotive companies, or the company itself. The Ford Foundation comes to mind. 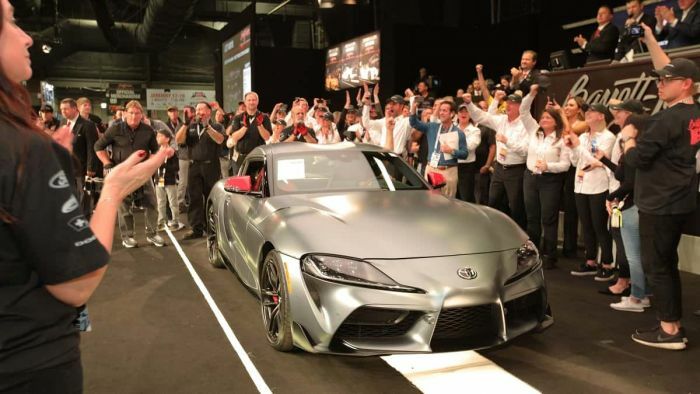 One of the easiest ways for automakers to generate big sums of money for charity is to auction off the first of a notable new vehicle. Everyone wins in such an endeavor. The automaker gets good press at the cost of a single automobile, the charity wins, since the dollar amounts of such a grant are often in the millions, and the person who buys the car wins since she gets a one-of-a-kind automobile. Just this month, Ford and Toyota have donated three of the first production cars they built to charity via one of thee auctions. Ford's new 2019 GT was auctioned off and generated a whopping 2.5 million. The first 2020 Supra generated 2.1 million, and the first Ford Mustang Shelby generated 1.1 million. In all, 5.7 million dollars was donated to charities, at a cost to the automakers of nearly zero. There are very few charitable donations that are so easy to put together and so beneficial. Looking back to the Tesla Model 3's launch in June of 2017, we still can't understand why Tesla and Elon Musk did not seize the opportunity to auction off the first Model 3. In retrospect, that car may well have generated a record amount for charity. The Tesla Model 3 was one of the most long-awaited, and most sought after luxury/performance cars in the modern era. Billionaires in California would have lined up to bid on it and take it home. In the end, a California billionaire did end up with it. Elon Musk. One of Tesla's wealthy board members had the first reservation and gifted the car to Musk, who accepted it. See our prior coverage, "First Tesla Model 3 Goes To Billionaire Rather Than Paid Customer Or Charity." Kimbal Musk, Elon's brother and member of many of the boards of director that relate to Elon Musk's companies did donate his personal Model 3 to charity. For more on Elon Musk's charitable background, we will refer readers to other publications, since that is not our forte.